Mensusa https://www.mensusa.com/articles/men's-silver-dress-shirts-that-create-an-interesting-look.html Men's Silver Dress Shirts That Create An Interesting Look Dress shirts have been one of the most essential elements of a man's attire from times unknown. Hence, men who aspire to dress up elegantly own quite a few of the designer dress shirts in their wardrobes. Apart from the basic colors, the most outstanding dress shirt that gives the wearer a different look are the men's silver dress shirts. Fashion industry is an innovative area where designers need to offer customers new products often and this need gives way to variations in designs, cuts, patterns and especially colors. If you want to stay tuned to fashion trends, you must keep some of the regular as well as unique shades of dress shirts ready at hand like the men's silver dress shirts. Why are the men's silver dress shirts so attractive? When you are bored with the same old colors and designs of your clothes and want something unique and at the same time sophisticated, then the best choice are the men's silver dress shirts. The main intention of wearing the appropriate dress shirt is to show off your personality and sense of style. Your shirt helps to interpret your intentions and this is a fact. Your mood is portrayed in your choice of outfits and wearing a silver dress shirt naturally gives you an amazing look at all gatherings. You can create an interesting disposition by matching the men's silver dress shirts with your existing suits correctly. Using this awesome shade innovatively portrays your exclusive sense of style and you can look absolutely smart and elegant in a silver color dress shirt. Men's silver dress shirts help to change your appearance from the professional to the casual, because the shade has a universal appeal and when combined with the perfect color suits, you are sure to draw the attention of all around. Moreover, the variety of silver dress shirts available at MensUSA easily creates a wonderful wardrobe for a style-conscious man. The glossy finish of silver dress shirts makes them so popular especially at parties. Different types of fabrics are used to make these shirts and the variety in sizes, cuts and fits allows every customer to select his shirt according to his requirements. 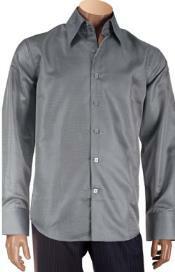 If you want to look jazzy, go for the metallic silver satin dress shirts that use fine satin poly fabrics. These men's silver dress shirts are just the best when you out to flaunt your style at the prom nights of parties. But for professional or formal occasions, the matt finish with white collar silver dress shirts is the appropriate choice. They offer a stylish and dignified look to the wearer. Wear trendy ties to add elegance to your total appearance. If you are confident about your attire, you will naturally be confident about yourself too. Select the proper accessories with the men's silver dress shirts and look outstanding wherever you go. Shop for these unique and versatile silver dress shirts at MensUSA to get the perfect fits and other accessories also to complete your looks.